A public service announcement for Frank Beamer and Jim Weaver: The moment you placed the empty national championship trophy case in your facility, the stakes were raised. No longer was the status quo, as unlikely as it is for a program in the heart of rural Virginia with no history of being nationally relevant, acceptable. A conference championship like 1995, a season remembered by older Hokie fans like me as a magical season, now means a guffaw and "I don't want to fly to Miami." The bar is higher, and you moved it with that trophy case. Unfortunately, this program is trending in the wrong direction. Virginia Tech used to win with a dominant defense, great special teams, and a ball control offense that played like a bully and limited mistakes. Offenses are catching up to the defense. Special teams have been in shambles for several seasons. The offense lacks any identity, other than being the team that struggling defenses circle on their schedule to get back on track. I will be frank. I almost did not do a film review this week. We have beaten the dead horses over and over again: the nonsensical running back rotation, poor offensive line leg drive and fundamentals, poor reads, throws, and pre-snap recognition by Logan Thomas, abysmal effort by the wide receivers, poor special teams, linebackers who are limited in space, and defensive backs who are not gifted enough to lock down receivers in man. The Miami game put a big spotlight on each one of these problems. Miami did everything they could to hand that game to Virginia Tech on a silver platter. Those were two woefully undisciplined college football teams that the nation watched on Thursday night, and ultimately, the Hokies lack of attention to detail derailed any attempt to gain a victory or make a late run at the ACC Championship game. The defense played well enough to win the football game, and what weaknesses they displayed have been well documented in this column. At the same time, harbor no illusions. They are not good enough to stop an elite offense without being able to generate huge amounts of pressure on the quarterback. The lack of speed and coverage ability makes it difficult to stop safety valve routes from becoming big plays, and the secondary just is not good enough to be effective for four quarters without a monster pass rush. While some players stood out with terrific efforts—James Gayle was electric on film, both getting to the quarterback utilizing terrific leverage technique against Seantrell Henderson and forcing the run. Miami spent the whole night running away from Gayle—many others just have not stepped up. J.R. Collins barely saw the field. Ronnie Vandyke played tentatively against the run, and in the 4th quarter was manhandled by Miami's tight ends. Jack Tyler had several ugly busts in coverage. Antone Exum was turned around in coverage several times, and twice looked averse to contact providing run support on long Miami runs. Florida State has been a team that has struggled against the Hokies unless they can beat Tech over the top. This secondary may be the cure to the FSU losing streak against the Hokies. The offense and special teams are in disarray right now. I had several passionate discussions about those issues with Key Play posters and staff immediately following the game, and one parallel comes to mind. The poor attention to detail and lack of discipline looks eerily similar to the end of the Bobby Bowden era. Examine the similarities to the Virginia Tech run. After an extended period of dominance (almost a decade straight of BCS bowls and 2 national championships), FSU went into a long period of mediocrity. Talent was high, but Bowden lost talented assistants and his staff became filled with cronies. FSU's offense became a running joke, as the simplistic scheme which incorporated elements here and there of other new concepts was shut down by less talented defenses. Changing offensive schemes negated FSU's formerly fearsome pass rush, which evened the playing field against their more talented defensive players. Attention to detail went by the wayside, and we are left with numerous images of Bowden on the sidelines, looking baffled at his team's inability to execute. We have seen that image a bunch of Beamer this season. Ultimately, Florida State forced change by forcing Bowden to accept Jimbo Fisher as the new offensive coordinator. Fisher had autonomy and started to clean house on offense, and then brought in his own staff when he took over full time. I don't think the same will exists for Beamer, but he clearly needs to accept that he has people on his staff that can't teach the game well enough for his team to win a National Championship. If that is his goal, he needs to be an administrator and bring in autonomous coaches who match his vision, but will recruit and teach their own system. Beamer must decide on an offensive identity, and then find an offensive coordinator who has the same vision but who can teach and recruit players that make that system work, even if they are not from Virginia. Exhibit A in the case to overhaul the offensive coaching staff is the game plan for Miami. All season, the Hokies have leaned heavily on changing their identity to a spread/zone read football team. During the off-week, the Hokies essentially scrapped their entire offense and went back to the pro "I" / 1 back offense that we saw last season. The Hokies ran 32 offensive plays in the first half, and 22 of those plays came from the I formation, the one-back two tight end set, or pass pro from the shotgun. Of the 8 remaining plays, only two came from the pistol, and of the six "read option" plays, four came inside the 20 yard line. Last season, we talked about identity. This season, we were seeing a new identity being adopted, but failures in execution and the messy running back rotation curtailed success. Instead of attempting to perfect the offense and deal with the growing pains, the first half against Miami represented a complete panic adjustment to the offense that O'Cain coached last season and prior to coming to Virginia Tech. As the game progressed, the Hokies reverted again, back to the read and veer option game and pass pro, and had more success, but ultimately could not overcome the mercurial play of Logan Thomas or an abysmal effort by the offensive line against a terrible Miami front. Ultimately, I saw an offense that has zero faith that the play called in the huddle will succeed, and without buy in from the players, no offensive coordinator can be successful. In this case, between the erratic play calling and the complete regression of Logan Thomas, I don't see how Mike O'Cain can be retained after this season. I will use the Boston College week to discuss Thomas in more detail, so I will focus on my old position, the offensive line, and fellow Emory & Henry alum Curt Newsome. I said in the offseason that this line grouping, while inexperienced, had the physical size, strength, and athleticism to be a better offensive line than last season. The allocation of playing time is baffling. We have discussed the poor fundamentals of the group, which carries over from previous seasons. Against the Hurricanes, they were not just fundamentally poor. The 118th ranked defensive line repeatedly manhandled the Hokie hogs throughout stretches of the game, and the victims of the whippings were players who were dependable early in the year. Florida State showcases perhaps four of the five best defensive tackles in the ACC, and a terrific edge rusher. Virginia Tech may be able to handle FSU's offense, but FSU's defensive line presents a huge talent to an undisciplined, fundamentally unsound and poorly coached unit. Most alarming to me is the regression of Vinston Painter. Painter repeated exhibited outstanding athleticism and motor earlier in the season. He was an effective drive blocker, and perhaps more than any other lineman, he was getting down field and helping bust open big runs by getting to the second level. Over the last two games, that Vinston Painter has vanished. Instead, Painter has looked disinterested blocking on the backside of running plays, and he has been atrocious in pass protection. Against Clemson, I counted Painter as responsible for a sack and three quarterback hurries. Against Miami, he performed even worse. His weakness is letting defensive ends get leverage and beating him to his inside shoulder. For a right tackle, this allows the end to be directly in the line of vision of the quarterback, so even limited pressure can impact the quality of the throw. Here we have Painter beaten inside after a simple X stunt by the defensive tackle and end. Painter has struggled with stunts most of the season, and here he appears to be focused outside as if a safety or corner may be blitzing in anticipation of him getting sucked inside by the end's loop to the interior. The tackle gets inside leverage on Painter's left shoulder, and he does not appear to have the strength to force the tackle back inside so Thomas can break contain. Thomas feels the heat, and makes a poor high throw to Roberts that is deflected and almost intercepted. Cardinal sin number one if you are a tackle: DON'T GET BEAT INSIDE. I wish Miami was an isolated incident, but we saw the same scenario play out on film against Clemson as well. Still, as a former lineman, I appreciate that sometimes you get caught thinking too much in pass protection, and if you become passive you will make poor reads. However, NOBODY who has Painter's physical ability (remember the Batman-like picture from the first fall scrimmage?) should have this happen to them. He was planted into the ground like a spring tulip. You would think that the running game would be a saving grace for Painter, and while he still has moments of brilliance, he is also being beaten way too often at the point of attack. Sadly, Painter was not the only bad actor during the Clemson game. Every player on the offensive line struggled during different stretches of the game. The same old problems reared their ugly heads. Nick Becton hops out of his stance instead of taking a strong lead step and fails to scoop block the defensive end on a sprint draw. My guy Brent Benedict gets dead feet in pass blocking and looks like he is on ice skates. And, it would not be a film review on the offensive line without David Wang's feet going dead. Here, Virginia Tech runs their base off tackle power play. Becton, Wang, and the tight end block down, and the fullback kicks out the end man on the line. Wang's feet go dead, and the Hurricane defensive tackle bench presses him back into the hole. The tight end and the fullback both miss their blocks, forcing Benedict (who is pulling from the back side) to take the first guy who crosses his face rather than the filling linebacker. The entire hole gets jammed up, prompting the following sound in my head. Ultimately, it is frustrating to keep beating these guys down. The Hokies moved the ball with a lineup of Painter-Benedict-Farris-Via-Becton in the 3rd quarter. But, these breakdowns coupled with the odd player rotation (and not playing the five best guys) can't be only the byproduct of having players that are not talented enough, especially when I can see Nick Becton MASH like this one play, and then fail on a simple scoop block the next. Newsome is the common thread, and he needs to be the first coach to go in an overhaul. Virginia Tech has come too far as a program to play out the string grasping at straws to make the Belk Bowl. The last three games of this season need to be about laying the foundation for a return to dominance, not hoping to squeeze out a couple of wins. If I was the person responsible for drawing the roadmap, here is what it would look like. If a senior is starting, and there is a talented backup who will start next year playing behind them, limit the number of snaps that senior has. With Dyrell Roberts, Marcus Davis, Nick Becton, Vinston Painter, Corey Fuller, Eric Martin, Antoine Hopkins, Jeron Gouveia-Winslow, Alonzo Tweedy, and Bruce Taylor, this is a .500 football team. Some of those players, like Bruce Taylor, must play due to the lack of depth at backer. However, this is the time to determine which guys can help you next year. I have been a big proponent of Ronnie Vandyke being an every down player, but he has struggled over the last two games. Still, the move of Tweedy to starting whip or playing JGW again, while probably deserved due to special teams efforts, isn't a move for the future. Painter and Becton have been the most solid offensive linemen, but is it wise to have Laurence Gibson and Mark Shuman take their first meaningful snaps of big time college football against Alabama, or should they warm up this year with Boston College? Frank Beamer must focus on the big picture. Beamer must also identify dead wood and open up scholarships. With Virginia getting ready to have two to three years of fantastic high school prospects, current players need to earn their scholarships or move on. Next season, the Hokies will use four scholarships on tight ends, none of which can redshirt and two of which came to Tech as defensive linemen. The whip position has turned into a dumping ground for guys who washed out of other positions, yet the most talented never gets to see the field. The linebacking corps is one injury next season away from being a disaster, and besides DJ Coles and Demetri Knowles, who is the playmaker on offense next year? Get as much space as possible, and move to step three. Turn up recruiting efforts. It is absolutely critical that the Hokies secure LOI's from Holland Fisher, Kendall Fuller, Drew Harris, and Wyatt Teller this offseason, but the net needs to be widened. The staff must restock the offensive line, which doesn't have a true freshman or redshirt freshman that impresses me as a quality ACC starter other than Augie Conte. Get into Pennsylvania and try to make some inroads while Penn State is down (the loss to Pitt doesn't help.) Da'Shawn Hand is the number one priority next season, but Beamer cannot lose Andrew Brown and Quin Blanding to UVA (or ACC schools.) Also, resources must be used to make more inroads into Ohio, Georgia, South Carolina, and North Carolina. If you want to be a national power, recruit like a national power. Delray Beach only has so many gems. Bryan Stinespring should be moved to recruiting coordinator, Shane Beamer to another position, and Frank Beamer must hire an autonomous offensive coordinator with a philosophy that matches Beamer's vision for winning. There is no place on this staff for Mike O'Cain, Curt Newsome, and Kevin Sherman (see wide receiver blocking videos). 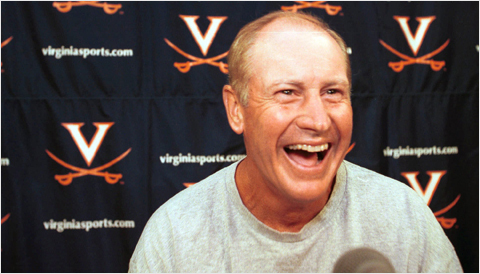 If Beamer wants them to run the pistol/spread/veer, then go to Nevada's coaching tree. Power I? Find someone with a Harbaugh pedigree like Willie Taggart at Western Kentucky. Pass happy? Tony Franklin is there to be had. Regardless of the system and the coach that is brought in, they must have autonomy to run and recruit the offense their way. Going back to the I and one-back this week had Beamer's fingerprints all over it. He doesn't understand offensive football, and never has. His decision making shouldn't go past selecting the coach and deciding on when to go for fourth down. If Beamer doesn't at least bring in a legitimate offensive line coach, I will riot. Thanks for your feedback everyone. Let's hope Thursday night doesn't turn into the Battle of the Little Bighorn. Beamer has the power to fix this. I agree with your proposed changes and vision, I hope others see things this way as well. French, your analysis of the offensive woes is spot on, and your prescription for what needs to happen to bring about positive change there is unequivocal. HCFB must revamp his entire offensive staff with a new OC and new position coach hires across the board, or 2013 and beyond are doomed seasons. The new OC needs to have the autonomy to hire guys that will coach his system well and get significant "buy-in" from the players, much like what has happened at Clemson and probably UNC. Our offense looks worse this season than any previous year since the beginning of Beamer's tenure because the effort and the coordination that comes from sound coaching are not evident. Beamer's early teams lost due to lack of talent, not lack of effort. The defense seems well coached, but just has lost a lot of players, especially in the secondary. I suspect the defense also suffers from mistrust of the offense's ability to win the game, which then affects the defensive morale. Special teams have been in the toilet the last few seasons, and I would argue that ST have been the deciding factor that cost us several games, most notably ECU a while back, Boise State and this Miami game. I hope and pray that you are correct, that we see a house cleaning on the offensive side this off-season and adopt a strong direction going forward with a new OC who will commit to a successful philosophy and recruit players who fit well in that scheme. If Richt can do it at UGA, why can't VT do the same? Thank you for all of the great analysis. Go Hokies! He's ran more than he's passed every year since Auburn. I don't think VT wants to win as bad as FSU. Bowden took FSU down with the ship at the end. They recovered, but he caused the damage to what he had built himself. The FSU brass (AD/boosters?) caused the Jimbo move, which ultimately saved them. I don't see that at VT. There aren't any boosters with that type of power here because they weren't boosters before Frank. The AD is a notorious budget wonk with poor personnel intuition. Frank has to make this move on his own, and he has proven in the past incapable of doing so. There is one chance, and it's Shane. I think Frank listens to Shane and Shane has to see the writing on the wall. The Beamer family has to have this grand vision of Frank coaching until he's 70 and handing it over to Shane. That won't happen unless there is significant change on the offensive side. I agree, Shane deserves a lot of criticism for the unfathomably stupid RB rotation. But he's our only shot at rebounding. You don't think Bud can step up and say something? He's been around for 20 years, this has been a distinct problem for over 10. Nothing has happened. Bud may have had a say 5 years ago, and significant enough change wasn't made. Now Bud's locked in with the annuity, he's lost any leverage he had. And, not seeing this as a negotiation but as a equity partner and friend in this investment, any voice he has had for change has to be diluted by now. If he was a proponent for offensive change as has been the gossip, it's clear that he hasn't been heard. Actually I think you're wrong about the boosters. I was at my son's football game a few weeks back and was talking with a couple who are contributors to the program and the wife told me that her son-in-law (who's a coach at Hargrave) is real good friends with Cornell Brown and that Cornell told him that nobody's job is safe on the staff. I've heard the same thing from other people too and also that it's being taken out of Coach Beamer's hands. Whether it happens or not we'll see. I just don't believe that Frank Beamer has the will or the strength to make the necessary changes. I agree with French that basically what happened at FSU is happening here and maybe what happened with the Head-Coach-in-waiting is going to have to happen here also. Not saying I want it to, especially with how it turned out at FSU but it may just have to be so. The reason I say that is do you really believe that Frank is going to make sweeping changes to his coaching staff? Nothing he's said or done this season or in the past leads me to believe that. In fact I've heard that the only reason he made staff changes after the '92 season was because the administration put pressure on him. Because of his success he has a lot more power now, probably even more so than Weaver. And do you believe that he will allow an outside OC to come in and be autonomous without being forced to? Also you know that whoever the OC is they're going to want to bring in their own staff, which Beamer also will not like. As far as what staff changes I'd want to make I could live with the whole offensive staff being fired except Shane. Move 'em out! Completely cleanse the program of the old guard. Yes Stiney is a good recruiter but if we get a competent OC and offense recruiting will take care of itself. Make Shane the ST coach and Frank can be the CEO. I'd also like to see a complete overhaul of the program. First of all we need a new AD who's willing to spend the money and do what it takes to get VT where it should be. I'd also like to see a culture change back to what VT used to be all about (i.e., hardwork, chip on the shoulder, discipline, pride etc.). I've watched Kansas State this season and I think OMG that's what VT used to be and SHOULD be!! (Can we kidnap Bill Stewart and bring him to VT? No? Didn't think so). I'd also like to see a change in how we promote the program to increase our fanbase. I've heard at different times that we don't have a big fanbase (or as big as other programs) and I wonder with the popularity of our program why that is? If you really meant Bill Stewart, allow me to show you the door. Haha, kidding. But seriously. No 'neer coaches allowed. Yea I meant Snyder. Sorry. Don't want to accept that this season could be more than an anomaly, but I'm afraid that's the case. I'm really hoping for changes on the Offensive Side of the ball and improvement on the Defense, but I'm just not sure it's possible. Not saying that VT will become NCst, but it's possible that we go 5 years without a BCS Bowl appearance. That's just scary. Especially with Duke on the up-and-up. Wait, what? You hit the nail on the head on so many fronts. I am having trouble watching games without fear of having an aneurysm as a result of the piss poor blocking effort of our wide receivers (I'm talking about you, Dyrell and Marcus). Even worse - and I know French you've discussed this ad naseum - how many times have we seen our O-line crumple into a heap of crap followed by Holmes running straight into said pile of teammates? When I watch other teams run the ball, even the mediocre offenses create enough space for their running backs to make plays. Outside of the Duke game, I can't recall too many of those moments for our backs. Its just getting tiring to watch week after week. I find myself looking forward to games each week thinking, "Okay, if we do this, this and this right we might be okay," rather than the attitude of old of, "screw the talent gap, we're going to punch them in the mouth from the opening whistle." is on my screen saver rotation. Love it! tyrod did it mikey! tyrod did it! The comparison to FSU's decline may be the part of this that disheartens me the most, since I can't disagree with you. Sad to see how this season has gone and the possible future of the program. And speaking of this season, I echo the sentiments of PhillyHokie007: "I am having trouble watching games without fear of having an aneurysm..." And I'll go further - I'll be completely honest and say I haven't watched an entire game since the opener with GT. Part of this is because of a schedule that hasn't allowed me to watch some of the games, but the ones I have watched, I'm forced to change the channel in order to keep my blood pressure at a reasonable level. The thing that always sticks out to me when I do watch is the disinterest and passionless play of many members of this team. I enjoy watching guys like Gayle, Jarrett, & Knowles because I feel like they're giving 100% no matter the score. Hell, I know Exum hasn't played up to expectations, but you can at least tell he's trying. I just find it hard to support this team at the moment because it doesn't seem like most care... I don't care if we lose, but at least show some fire. I don't know if it's a result of no confidence in the playcalling or lack of execution, but it's clear to me that Beamer has lost control of this team, and that to me signals a need for change. Whew, that felt good to get out... rant over for now. it was 7-3, we had dominated and were losing. I missed Dukes big KO return right after that. Instead, we watched Melancholia, a totally bizarre Lars von Trier movie. Kirsten Duntz was hot at times, very much not hot at others. But it was a good movie because it stuck with me. Then, I rejoined my own melancholia and watched the last 3 minutes of the game. I think we'll do the same tomorrow, its just not worth the emotional commitment to watch games live anymore. We have seen this scenario played out at FSU, Penn State, Michigan, and Tennessee. Ultimately, the long term coach becomes surrounded with yes men, and either the administration forces the head coach out or forces changes. At the same time, it is a tricky proposition. While Jimbo Fisher has started to turn the corner with Florida State, Tennessee forced out Phil Fulmer and the result was Lane Kiffen and Derrick Doolander. The grass isn't always greener. The question that Virginia Tech boosters and Jim Weaver has to ask when they start stepping on Beamer's toes is, do you accept that being an ACC contender is enough, or do you kick the can and go high risk in an attempt to be a true national power? Ultimately, we have to hope that Beamer has the competative streak and the humble nature to recognize that his pals are not cutting the mustard, and that he is on a path to derailing all that he has worked for. 2010 was really the first red flag. There was no reason for that team to lose a game, but Foster was lazy recruiting and suddenly there was no defensive line. Then offensively, the three running back rotation never should have happened and made the running game inconsistant. Last year, Clemson passed them by. Now it looks like FSU and UNC are passing them by. We need to go back to being the bully. Playing in Lane Stadium, the opponent should know that the Hokies are going to beat you up running the football, and hit you harder than any other team you play when you have the ball. That has not happened this season. An upset would be the most inexplicable win for in the entire history of VT Football. A team that has struggled in every phase of the game, and in the intangibles (i.e. motivation and leadership). If having a losing record this season means making the right changes in our coaching and approach to college football, then so be it. for one game. Look at uva this weekend. Look at the inexplicable 2005 meltdown vs. Miami, then the next week blowout @ uva. Furthermore, the last two games, VT has held significant statistical advantages over two good teams.... and...... we've been blown out. That's a lot of bad bounces, poorly time penalties, execution errors that can be turned around quickly. I think we will play very well versus FSU, but we need them to play poorly to mediocre to actually win. If they play well, we'll just have a good loss on our record. The Hokies would have every right to be proud of themselves after a victory over fsu. However, fsu plays at such a high level. But given that this is an ACC game, who knows? Is this the level you think we have sunk? Weaver will fire O'Cain and Newsome. BS will move to OL coach or recruiting coordinator. Shane will move to ST coach. Weaver then retires...he'll be the heavy/bad guy allowing Frank to save face with his buddies (side note: if they were really good friends they would've quit before as not to hurt their friend Frank). We know none of this will happen until the off season...BUT Here's the kicker...it will be after Bud is interviewing for other positions (or accepts one). Weaver will react, as is his style, rather than be proactive. While I keep seeing Foster to Kentucky rumors, it isn't happening. He is one year away from cashing in a huge annuity from VT.
That being said, if Foster leaves, I would love to see Beamer hire Todd Grantham. While getting a big space eater at nose would be problematic, the 3-4 has the same responsibilities for inside linebackers as Foster's defense and would benefit guys like Edwards and Van Dyke who are better on the edge in space. Bama has an offense where the opponent knows they will be run-happy, but can still move the ball at will. We should aim to do the same, since I don't see us being an explosive offense like Oregon, WVU, or even Clemson & UNC. Our recruiting strategy on offense has to absolutely prioritize an O-line that is formidable in every way. Perhaps we should also emulate FSU. The fact is, if VT can't reliably run the ball the passing game can't bail us out. We all know this to be true. Tyrod (and other standout duel-threat QBs) was able to compensate a lot of our offensive woes with his elusiveness and big play abilities. is that despite this alleged Beamer philosphy of power/ball control offense, we don't recruit enough OL to make it happen. I looked back over the last few recruiting classes, and we've brought in 3 OL each year on average. That includes transfers along with TE's and DT's that have switched to OL. There's been some with 5, some with 1, etc. But it comes about to about 3 per year. Over 5 recruiting classes that can expected to be in the program at any given time, that's only 15 OL. 15 guys for 5 spots. Barely a 3-deep. And that's if everyone pans out and stays healthy. Meanwhile we've got 8-9 DE's for two positions, going 4-5 deep. OL is one of the toughest positions to project, so we should be overrecruiting to allow for the inevitable misses & injuries, not underrecruiting. I really think we need to switch to an offensive system that better fits the talent available in VA. Power running is not it. The lineman are just not available in VA and this staff rarely pulls in top OL prospects from out of state. I agree with the recruiting philosophy grounded in the talents of your catchment to a degree. At the same time, you can't necessarily allow the type or style of players within your talentbase to hold your offensive and/or defensive schemes hostage on an annual basis. There are a variety of reasons, one of which being there is no guarantee you're going to get any of them on your roster. More baffling is that for the first time I can remember, the Hokies have two four star tackle prospects who were both top 10 at their position recruits in Laurence Gibson and Mark Shuman. Both have great size, excellent feet, and Gibson has shown the smarts to play multiple positions. Yet, neither have sniffed the field. If I was an OL, why the hell would I want to come there? Though I'm a Giants fan, I have to acknowledge that Belichek's draft philosophy in building great offensive lines first and foremost has made Brady the great pro QB he is. VT absolutely must win the battle in the trenches, on both sides of the ball. Even the defense has come up short in that aspect, this year. Thanks French. A little harder for me to follow some of the videos because I dont know the OL numbers as well, but well written and I could definitely see the problems. We then went on to feature Vick at WR 2 games later... again, lack of identity, and we're still seeing it today. You're being a little harder on O'Cain than I would be. Not a whole lot, but a little. I agree that he should go, but that's more about LT's regression and his history at other programs and needing to give a new OC (which we desperately need) the freedom to pick his own QB coach (or be the QB coach). I don't know that the problems with our offensive scheme(s) can legitimately be laid at his door. He's responsible for play calling, but Stiney is still responsible for scheme and game planning, right? And as you said toward the end, some of that is quite possibly coming from Beamer as well. Both outrank O'Cain, so he can argue, but do you think Beamer at least would ever allow himself to be argued down by O'Cain? btw, the last Painter video isn't linked to the right place. My prediction is that O'Cain is used as a scapegoat during the off-season so that Beamer can protect his son and his adopted son (Stiney). The wild card is Newsome, who I think is the biggest problem on the staff. Hopefully they'll get rid of him along with O'Cain. But the end result will be a Shane/Stiney offense methinks.